This Thursday, March 31 from 4:30-6:30 in CUC Rangos Ballroom, the Humanist League, Student Life Office, Inter-Fellowship Association, and CMU OM are putting on an Interfaith Forum. 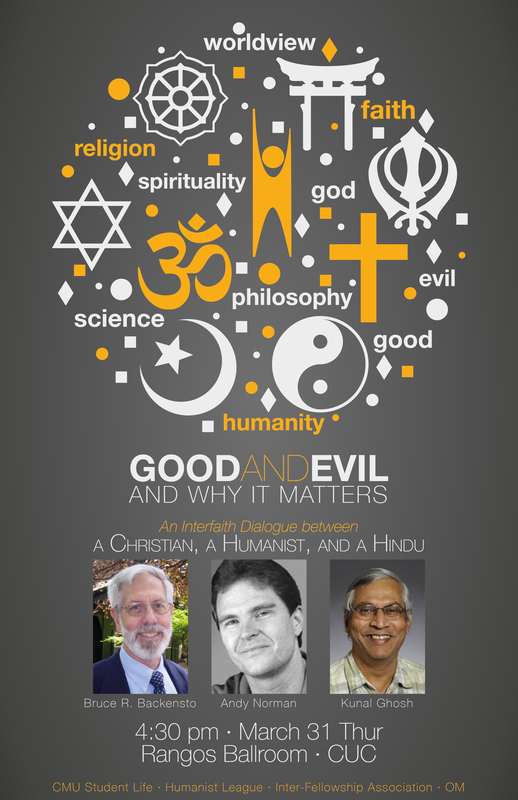 On Good and Evil, and Why It Matters, a Christian (Bruce Backensto), a Secular Humanist (Andy Norman), and a Hindu (Kunal Ghosh) will share their perspectives. Come and explore some of life’s important questions. Panel discussion followed by Q&A and small-group conversations. There will be light refreshments. Find out more more on our Facebook event!